Sad news from Berlin: the passing of critic, novelist, and essayist Christa Wolf. 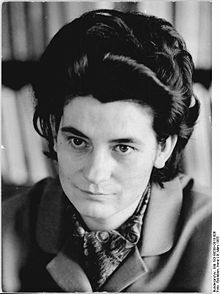 Long credited for helping to establish a distinctive East German literary voice, Wolf was the author of numerous works, including Divided Heaven, The Quest for Christa T., Patterns of Childhood, Cassandra, Medea, On the Way to Taboo, and Accident: A Day’s News. Though much of Wolf’s work engaged with issues of feminism, self-reflexivity, societal pressures, and German fascism, it was her quest for “subjective authenticity” that helped to position her literary output in vital proximity to the social and political issues of her time. In 2002, Wolf was awarded the inaugural German Book Prize for her lifetime achievement. In her 1994 lecture “Parting from Phantoms: On Germany,” extracted here, Wolf reflects on Germany’s reckoning with its history five years after reunification. Along the way, she describes confronting “a compromising phase in my past” and the uproar that ensued when she revealed that she had worked as an informal collaborator for the East German secret police between 1959 and 1962. “Parting from Phantoms: On Germany” appears in full in Christa Wolf’s Parting from Phantoms: Selected Writings, 1990-1994, published by the University of Chicago Press. ** Parting from Phantoms: . . .